Daniel Kahneman's Thinking Fast and Slow is probably one of the best non-fiction books ever written. Not only has it sold millions of copies, but it really deserves to be read that much. If you look at the list of best selling books from the past ten years, Kahneman's work sticks out almost grotesquely from things like The Hunger Games and 50 Shades of Grey. There is an element of chance involved to almost all fiction best sellers - word-of-mouth is still the best marketing method and readers are not as rational as they like to think. Thinking Fast and Slow on the other hand was a compendium of the most important ideas in modern psychology put in a somewhat readable package. It became a best seller nonetheless. 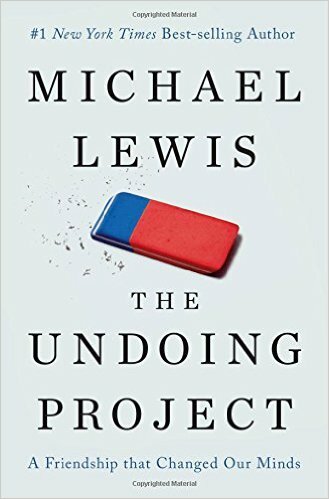 Michael Lewis looks at the same subject matter, but from a typically Lewisian angle. 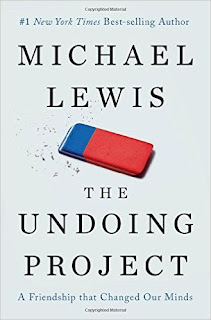 The Undoing Project is the personal story of Kahneman and his research partner Amos Tversky and their quest to reform psychology research. It doesn't sound like much of a premise, but as always Lewis is able to create an extremely compelling narrative. Kahneman is an inherently pessimistic intellectual who, as a child, had to hide from the Germans in Nazi occupied France. Tversky is a superstar academic, war hero and socialite. Their paths cross in 1960s Israel and they become one of the most influential duos in academia. Where Thinking Fast and Slow was strictly about psychology and human decision making, The Undoing Project focuses more on the personalities and lives of the researchers. As I've mentioned previously, I greatly enjoy reading about discoveries from the discoverer's point of view. Researchers don't often make for very entertaining reads, but the depth of Lewis's research ensures that there are always multiple interesting topics to explore. I was surprised to find myself tearing up towards the end; I really didn't expect The Undoing Project to be as soulful as it is. Having read The Undoing Project, I was struck by how little we currently take advantage of its insights. High school psychology is (or was, but I'd be surprised if anything had changed) a strange combination of vaguely important historical findings heralded as breakthroughs (Pavlov's dogs, for example) and outright absurd references to theories that have long been dismissed (anything Freud). These are life changing concepts that alter the way we think about ourselves. Why is this not part of the standard curriculum?